Alex is interested in surgery, particularly vascular and orthopaedics, as well as obstetrics and gynaecology. He thoroughly enjoys Convention and playing pool in the RPA common room. The surgical management of AAAs dates back over 3000 years and has evolved greatly since its conception. Over the course of surgical history arose three landmark developments in aortic surgery: crude ligation, open repair and endovascular AAA repair (EVAR). This paper aims to examine the development of surgical interventions for AAA, from its experimental beginnings in ancient Egypt to current evidence based practice defining EVAR therapy, and to pay homage to the surgical and anatomical masters who made significant advances in this field. The word aneurysm is derived from the Greek aneurysma, for ‘widening’. The first written evidence of AAA is recorded in the ‘Book of Hearts’ from the Eber Scolls of ancient Egypt, dating back to 1550 BC. It stated that “only magic can cure tumours of the arteries.” India’s Sushruta (800 ~ 600 BC) mentions aneurysm, or ‘Granthi’, in chapter 17 of his great medical text ‘Sushruta Samhita’. Although undistinguished from painful varicose veins in his text, Sushruta shared a similar sentiment to the Egyptians when he wrote “[Granthi] can be cured only with the greatest difficulty”. Galen (126-c216 AD), a surgeon of ancient Rome, first formally described these ‘tumours’ as localised pulsatile swellings that disappear with pressure. He was also first to draw anatomical diagrams of the heart and great vessels. His work with wounded gladiators and that of the Greek surgeon Antyllus in the same period helped to define traumatic false aneurysms as morphologically rounded, distinct from true, cylindrical aneurysms caused by degenerative dilatation. This work formed the basis of the modern definition. Antyllus is also credited with performing the first recorded surgical interventions for the treatment of AAA. His method involved midline laparotomy, proximal and distal ligation of the aorta, central incision of the aneurysm sac and evacuation of thrombotic material. Remarkably, a few patients treated without aseptic technique or anaesthetic managed to survive for some period. Antyllus’ method was further described in the seventh century by Aetius, whose detailed paper ‘On the Dilation of Blood Vessels,’ described the development and repair of AAA. His approach involved stuffing the evacuated sac with incense and spices to promote pus formation in the belief that this would aid wound healing. Although this belief would wane as knowledge of the process of wound healing improved, Antyllus’s method would remain largely unchanged until the late nineteenth century. The Renaissance saw the birth of modern anatomy, and with it a proper understanding of aortic morphology. In 1554 Vesalius (1514-1564) produced the first true anatomical plates based on cadaveric dissection, in ‘De Humani Corporis Fabrica.’  A year later he provided the first accurate diagnosis and illustrations of AAA pathology. In total, Vesalius corrected over 200 of Galen’s anatomical mistakes and is regarded as the father of modern anatomy. His discoveries began almost 300 years of medical progress characterised by the ‘surgeon-anatomist’, paving the way for the anatomical greats of the sixteenth, seventeenth and eighteenth centuries. It was during this period that the great developments in the anatomical and pathological understanding of aneurysms took place. Ten further unsuccessful cases were recorded prior to the turn of the twentieth century. It was not until a century later, in 1923, that Matas performed the first successful complete ligation of the aorta for aneurysm, with the patient surviving seventeen months and dying from tuberculosis. Described by Osler as the ‘modern father of vascular surgery’, Matas also developed the technique of endoaneurysmorrhaphy, which involved ligating the aneurysmal sac upon itself to restore normal luminal flow. This was the first recorded technique aiming to spare blood flow to the lower limbs, an early prelude to the homograft, synthetic graft and EVAR. Many would argue that the true father of modern vascular techniques is Alexis Carrel. He conducted the first saphenous vein bypass in 1948, the first successful kidney transplant in 1955 and the first human limb re-implantation in 1962. [13,29] Friedman states that “there are few innovations in cardiac and vascular surgery today that do not have roots in his work.”  Perhaps of greatest note was Carrel’s development of the triangulation technique for vessel anastomosis. This technique was utilised by Crafoord in Sweden in 1944, in the first correction of aortic coarctation, and by Shumacker  in 1947 to correct a four centimetre thoracic aortic aneurysm secondary to coarctation. Prior to this time, coarctation was treated in a similar fashion to AAA, with ligation proximal and distal to the defect. These developments would prove to be great milestones in AAA surgery as the first successful aortic aneurysm resection with restoration of arterial continuity. This discovery led to the first replacement of a thrombosed aortic bifurcation by Jacques Oudot (1913-1953) with an arterial homograft in 1950. The patient recovered well, and Oudot went on to perform four similar procedures. The landmark first AAA resection with restoration of arterial continuity can be credited to Charles Dubost (1914-1991) in 1951. His patient, a 51 year old man, received the aorta of a young girl harvested three weeks previously. This brief period of excitement quickly subsided when it was realised that the long-term patency of aortic homografts was poor. It did, however, lay the foundations for the age of synthetic aortic grafts. In addition to the investigative power of ultrasound imaging, computed tomography (CT) scanners became available in the early 1970s. As faster, higher-resolution spiral CT scanners became more accessible in the 1980s, the diagnosis and management of AAAs became significantly more refined. CT angiography has emerged as the gold standard for defining aneurysm morphology and planning surgical intervention. It is crucial in determining when emergent treatment is necessary, when calcification and soft tissue may be unstable, when the aortic wall is thickened or adhered to surrounding structures, and when rupture is imminent. Overall operative mortality from ruptured AAA fell by 3.5% per decade from 1954-1997. This was due to both a significant leap forward in surgical techniques in combination with drastically improved imaging modalities. The journey towards truly effective surgical intervention for AAA has been a long and experimental one. Once regarded as one of the most deadly pathologies, with little chance of a favourable surgical outcome, AAAs can now be successfully treated with minimally invasive procedures. Sushruta’s millennia-old fear of abdominal aortic surgery appears well and truly overcome. Kumar V et al. Robbins and Cotran Pathologic Basis of Disease 8th ed. Elsevier. 2010. Semmens J, Norman PE, Lawrence-Brown MMD, Holman CDJ. Influence of gender on outcome from ruptured abdominal aortic aneurysm. British Journal of Surgery. 2000;87:191-4. Jamrozik K, Norman PE, Spencer CA. et al. Screening for abdominal aortic aneurysms: lessons from a population-based study. Med. J. Aust. 2000;173:345-50. Semmens J, Lawrence-Brown MMD, Norman PE, Codde JP, Holman, CDJ. The Quality of Surgical Care Project: Benchmark standards of open resection for abdominal aortic aneurysm in Western Australia. Aust N Z J Surg. 1998;68:404-10. The EVAR trial participants. EVAR-1 (EndoVascular Aneurysm Repair): EVAR vs open repair in patients with abdomial aortic aneurym. Lancet. 2005;365:2179-86. National Heart Foundation of Australia. The Shifting Burden of Cardiovascular Disease. 2005. Fleming C, Whitlock EP, Beil TL, Lederle FA. Screening for abdominal aortic aneurysm: a best-evidence systematic review for the U.S. Preventive Services Task Force. Ann Intern Med. 2005;142(3):203-11. United Kingdom Small Aneurysm Trial Participants. UK Small Aneurysm Trial. N Eng J Med. 2002;346:1445-52. Ghalioungui P. Magic and Medical Science in Ancient Egypt. Hodder and Stoughton Ltd. 1963. Bhishagratna KKL. An English Translation of The Sushruta Samhita. Calcutta: Self Published; 1916. Lytton DG, Resuhr LM. Galen on Abnormal Swellings. J Hist Med Allied Sci. 1978;33(4):531-49. Suy R. The Varying Morphology and Aetiology of the Arterial Aneurysm. A Historical Review. Acta Chir Belg. 2006;106:354-60. Friedman SG. A History of Vascular Surgery. New York: Futura Publishing Company 1989;74-89. Stehbens WE. History of Aneurysms. Med Hist 1958;2(4):274–80. Van Hee R. Andreas Vesalius and Surgery. Verh K Acad Geneeskd Belg. 1993;55(6):515-32. Kulkarni NV. Clinical Anatomy: A problem solving approach. New Delhi: Jaypee Brothers Medical Publishers. 2012;4. Paré A. Les OEuvres d’Ambroise Paré. Paris: Gabriel Buon; 1585. Morgagni GB. Librum quo agitur de morbis thoracis. Italy: Lovanni; 1767 p270-1. Monro DP. Remarks on the coats of arteries, their diseases, and particularly on the formation of aneurysm. Medical essays and Observations. Edinburgh, 1733. Matas R. Surgery of the Vascular System. AMA Arch Surg. 1956;72(1):1-19. Brock RC. The life and work of Sir Astley Cooper. Ann R Coll Surg Engl.1969; 44:1. Matas R. Aneurysm of the abdominal aorta at its bifurcation into the common iliac arteries. A pictorial supplement illustration the history of Corrinne D, previously reported as the first recored instance of cure of an aneurysm of the abdominal aorta by ligation. Ann Surg. 1940;122:909. Velpeau AA. Memoire sur la figure de l’acupuncture des arteres dans le traitement des anevrismes. Gaz Med. 1831;2:1. Moore CH, Murchison C. On a method of procuring the consolidation of fibrin in certain incurable aneurysms. With the report of a case in which an aneurysm of the ascending aorta was treated by the insertion of wire. Med Chir Trans. 1864;47:129. Siddique K, Alvernia J, Frazer K, Lanzino G, Treatment of aneurysms with wires and electricity: a historical overview. J Neurosurg. 2003;99:1102–7. Pearse HE. Experimental studies on the gradual occlusion of large arteries. Ann Surg. 1940;112:923. Harrison PW, Chandy J. A subclavian aneurysm cured by cellophane fibrosis. Ann Surg. 1943;118:478. Cohen JR, Graver LM. The ruptured abdominal aortic aneurysm of Albert Einstein. Surg Gynecol Obstet. 1990;170:455-8. Edwards WS, Edwards PD. Alexis Carrel: Visionary surgeon. Springfield, IL: Charles C Thomas Publisher, Ltd 1974;64–83. Shumacker HB Jr. Coarctation and aneurysm of the aorta. Report of a case treated by excision and end-to-end suture of aorta. Ann Surg. 1948;127:655. Alexander J, Byron FX. Aortectomy for thoracic aneurysm. JAMA 1944;126:1139. Carrel A. Ultimate results of aortic transplantation, J Exp Med. 1912;15:389–92. Carrel A. Heterotransplantation of blood vessels preserved in cold storage, J Exp Med. 1907;9:226–8. Guthrie CC. Heterotransplantation of blood vessels, Am J Physiol 1907;19:482–7. Dubost C. First successful resection of an aneurysm of an abdominal aorta with restoration of the continuity by human arterial graft. World J Surg. 1982;6:256. Voorhees AB. The origin of the permeable arterial prosthesis: a personal reminiscence. Surg Rounds. 1988;2:79-84. Voorhees AB. The development of arterial prostheses: a personal view. Arch Surg. 1985;120:289-95. Voorhees AB. How it all began. In: Sawyer PN, Kaplitt MJ, eds. Vascular Grafts. New York: Appleton-Century-Crofts 1978;3-4. Blakemore AH, Voorhees AB Jr. The use of tubes constructed from vinyon “N” cloth in bridging arterial defects – experimental and clinical. Ann Surg. 1954;140:324. Schumacker HB, Muhm HY. Arterial suture techniques and grafts: past, present, and future. Surgery. 1969;66:419-33. Lidman H, Faibisoff B, Daniel RK. Expanded Polytetrafluoroethene as a microvascular stent graft: An experimental study. Journal of Microsurgery. 1980;1:447-56. Cooley DA, DeBakey ME. Surgical considerations of intrathoracic aneurysms of the aorta and great vessels. Ann Surg. 1952;135:660–80. DeBakey ME. Successful resection of aneurysm of distal aortic arch and replacement by graft. J Am Med Assoc. 1954;155:1398–403. Argenteri A. The recent history of aortic surgery from 1950 to the present. In: Chiesa R, Melissano G, Coselli JS et al. Aortic surgery and anaesthesia “How to do it” 3rd Ed. Milan: Editrice San Raffaele 2008;200-25. Green Sy, LeMaire SA, Coselli JS. History of aortic surgery in Houston. In: Chiesa R, Melissano G, Coselli JS et al. Aortic surgery and anaesthesia “How to do it” 3rd Ed. Milan: Editrice San Raffaele. 2008;39-73.
of the movements of heart walls. Clin Physiol Funct I. 2004;24:118–36. Ian D. The investigation of abdominal masses by pulsd ultrasound. The Lancet June 1958;271(7032):1188-95. Thompson SG, Ashton HA, Gao L, Scott RAP. Screening men for abdominal aortic aneurysm: 10 year mortality and cost effectiveness results from the randomised Multicentre Aneurysm Screening Study. BMJ. 2009;338:2307. Filipovic M, Goldacre MJ, Robert SE, Yeates D, Duncan ME, Cook-Mozaffari P. Trends in mortality and hospital admission rates for abdominal aortic aneurysm in England and Wales. 1979-1999. BJS 2005;92(8):968-75. Kevles BH. Naked to the Bone: Medical Imagine in the Twentieth Century. New Brunswick, NJ: Rutgers University Press 1997;242-3. Ascher E, Veith FJ, Gloviczki P, Kent KC, Lawrence PF, Calligaro KD et al. Haimovici’s vascular surgery. 6th ed. Blackwell Publishing Ltd. 2012;86-92. Bown MJ, Sutton AJ, Bell PRF, Sayers RD. A meta-analysis of 50 years of ruptured abdominal aortic aneurysm repair. British Journal of Surgery. 2002;89(6):714-30. Criado FJ. The EVAR Landscape in 2011: A status report on AAA therapy. Endovascular Today. 2011;3:40-58. Criado FJ. EVAR at 20: The unfolding of a revolutionary new technique that changed everything. J Endovasc Ther. 2010;17:789-96.
endovascular abdominal aortic aneurysms treatment. Interventional Cardiology. Volodos NL, Shekhanin VE, Karpovich IP, et al. A self-fixing synthetic blood vessel endoprosthesis (in Russian). Vestn Khir Im I I Grek. 1986;137:123-5. Lazarus HM. Intraluminal graft device, system and method. US patent 4,787,899 1988. Balko A, Piasecki GJ, Shah DM, et al. Transluminal placement of intraluminal polyurethane prosthesis for abdominal aortic aneurysm. J Surg Res. 1986;40:305-9. Lawrence-Brown M, Hartley D, MacSweeney ST et al. The Perth endoluminal bifurcated graft system—development and early experience. Cardiovasc Surg. 1996;4:706–12. White GH, Yu W, May J, Stephen MS, Waugh RC. 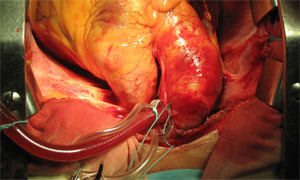 A new nonstented balloon-expandable graft for straight or bifurcated endoluminal bypass. J Endovasc Surg. 1994;1:16-24. May J, White GH, Yu W, Waugh RC, McGahan T, Stephen MS, Harris JP. Endoluminal grafting of abdominal aortic aneurysms: cause of failure and their prevention. J Endovasc Surg. 1994;1:44-52. May J, White GH, Yu W, Ly CN, Waugh R, Stephen MS, Arulchelvam M, Harris JP. Concurrent comparison of endoluminal versus open repair in the treatment of abdominal aortic aneurysms: analysis of 303 patients by life table method. J Vasc Surg. 1998;27(2):213-20. Omran R. Abul-Khouodud Intervention for Peripheral Vascular Disease Endovascular AAA Repair: Conduit Challenges. J Invasive Cardiol. 2000;12(4). West CA, Noel AA, Bower TC, et al. Factors affecting outcomes of open surgical repair of pararenal aortic aneurysms: A 10-year experience. J Vasc Surg. 2006;43:921–7. The EVAR trial participants. EVAR-2 (EndoVascular Aneurysm Repair): EVAR in patients unfit for open repair. Lancet. 2005;365:2187-92.